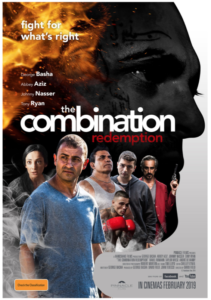 An exciting new movie called ‘The Combination Redemption’ will be released into cinemas early next month- with the creative forces hailing from the Northern Illawarra. David Field has directed the film, which opens on February 7 at Event Cinema Wollongong. David is a familiar face on Australian screens having appeared in just about every locally-produced TV show in the last 20 years including Underbelly, City Homicide, A Country Practice, Blue Heelers and The Secret Daughter. The film’s editor is esteemed local resident Shelly O’Neil, who also has an impressive CV centred on the Australian TV and film industry. Nine years ago, David and writer George Basha released ‘The Combination”. While not a traditional sequel, this new movie follows-on, once again telling a story of life in a community based in Sydney’s western suburbs. It’s been a hard slog to take the movie from concept to screen but David and his team are determined to tell the story of life in suburban Australia and they have worked hard to see The Combination Redemption released by the big cinema chains across the country. David says the film is intense, but entertaining. And David says Coledale film editor Shelly O’Neil has done en exceptional job. And you can watch the movie at Wollongong’s Event Cinemas from February 7.